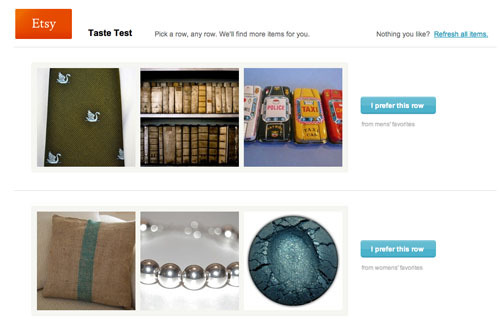 Recently, Etsy has began a new feature called the Etsy Taste Test. 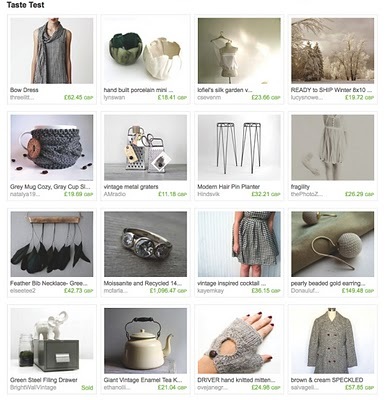 Here you can take a visual test to determine what types of clothing, jewelry, art, home accessories, and handmade items interest you. Then after clicking on each of your favorite images in each group (about 10 groups in all), they give you a specialized page with the results of your quiz featuring similar products. Check out the test result pages below. This is a great way of weeding through the tremendous amount of content on the site and also a terrific way to find gifts quickly. Pinterest - My New Love!